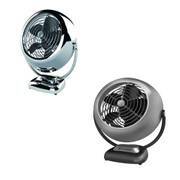 Ever since the year 1945 Vornado fans and air circulators have been enjoying enormous popularity. A patent forms the basis of this success that provides leading technology, leaving conventional pedestal and floor fans behind. The basic design was called “Vortex-Tornado“ by engineer Ralph K. Odor. The name Vornado results from both the terms Vortex and Tornado. A desk, floor or pedestal fan were driven by hydraulic power or an elastic spring until the late 19th century. The rest of the technology is still used today: Air is sucked in by the fan blades and blown out at a centrifuged angle. In 1882 a more powerful, electric driven fan was designed by Philip H. Diel by utilising the motor of a sewing machine. This was the basis for more efficient and oscillating devices to come. Oscillating floor and pedestal fans rotate the fan’s upper part in a semi-circle, thus circulating air in a larger area. The step of the development began in 1923: The concept of an air circulator drafted by Ralph K. Odor stands out due to a significant improvement concerning the reach and efficiency of the circulation. The patented technology allows even air circulation that ensures a uniform temperature in the whole room. The engineer thus refers to his appliances as circulators rather than fans. At that time Ralph K. Odor researched airplane propellers and turbines. He discovered how to increase circulation of fans as well. The Vornado difference stems from the mode of operation of the products. A Vornado transports the air sucked in from the back through an elongated cylinder, thereby increasing the amount of moved air. In the picture you can see the narrow construction that leads the concentrated air to the deep pitch blades. The accelerated airflow is pressed through a spiral grill on the front part of the device. This creates a circulating airflow –a tiny tornado. The airflow is powerful enough to travel a 30m distance to mix cold and hot air zones. The airflow bounces off smooth surfaces such as a wall or the ceiling, the flow is direct back to the inlet nozzle. Finally, the entire indoor air is circulated and the temperature equalizes in the process. That means, warm air on the upper level of the room is mixed with cold air at ground level, a more pleasant and balanced temperature is created. Vornado fans and other circulatos by the brand, such as fan heaters feature patented state-of-the-art rotation and ventilation technology. They provide a uniform indoor climate without any unpleasant draught. Four key elements set Vornado circulators apart from conventional oscillating fans. Ideal for large rooms, stairwells, hallways, etc. In the summer the appliance is used as a cooling fan or to support air circulation from the air conditioning system. In the winter, autumn or spring time the devices help to circulate heat from the heater, stove or fireplace in the room. This causes cold and warm layers of air to blend. For example, if the ceiling level has a temperature of 23°C and the floor measures 18°C, the Vornado unit creates an uniform temperature of 21°C. The portable device will support you your-round and can be carried from one room to another, or wherever you want to go. William H. Odor’s Arcadia Round Barn. Ralph Keely Odor was born in April of the year 1895 in Arcadia, Oklahoma, USA. The dreaded Tornado Alley passes right through Oklahoma, causing particularly devastating tornados. A tornado is a powerful, vertical column of rotating air. In May 1999 parts of Oklahoma were destroyed by several tornados of different ratings up to “violent” F4 and F5 classifications. The 1999 Oklahoma tornado outbreak marks one of the most devastating natural disasters in the history of the USA and includes a tornado with the highest observed wind speed ever. The Odor family used to operate a farm that needed to be protected against forces of nature. In 1898 Mr. Odor senior constructed a round barn that gave wind less contact surface. The historic Arcadia Round Barn gained publicity both due to its design and close proximity to the famous Route 66. Today, Arcadia Round Barn is a popular landmark and tourist attraction. Ralph K. Odor has his origins in a turbulent region – this could have been a reason for his research of air and airflow. He also lived during a rough time in history. As a young man he served in the First World War and returned as a veteran. Odor first came into contact with aviation during his military service. Afterwards, he experimented with improved propellers for planes during his time as an engineer. Approximately in 1923 he discovered that a propeller rotates more efficiently if the incoming air is channeled through a tight tube first. He improved this technology and implemented it in a “Vornado Plane” in 1929. In order to ensure the required length he lead the air diagonally across. This video from the year 1931 is filmed by a student of the University of Oklahoma. It shows an unmanned “Vornado” test flight. Ralph Keely Odor wears a white suit and a hat. At age 36, the inventor proudly presents his model. Things we take for granted nowadays were developed in many steps back then. A long wire supplied the plane’s electric motor with the required power. The wire is mounted to a pole in the centre of the flight path. Naturally, this would limit the possible radius of the area where the flight could take place. This seemingly odd construction can also be seen in the video. Mr Odor’s system provided the required speed for the large propeller, the plane takes off. The patent for the drive by air circulation was submitted in 1934, after thorough examination it was approved 4 years later. Mr Odor dedicated the following years to more research and submitted a variety of other patents, including for example an indoor air circulator. After the end of the Second World War he began working with Ottis A. Sutton who lead a company for airplane welders. Sutton however did not use Odors inventions for the engines, but rather for fans with air circulators. Having experienced an eventful company history and being part of a large family, Mr Odor passed away at the considerable age of 92 years. Over the course of their cooperation, Ralph K. Odor and Ottis A. Sutton realised in the 1930s just how useful their designs for aircrafts would be if implemented in common household items. The Vornado technology improved air circulation even in small devices. Vornado fans were first produced by Propellerair in Springfield, Ohio. After the end of the Second World War, Odor and Sutton founded the company O. A. Sutton Corporation and introduced the brand “Vornadofan”. The business continued this way until 1959. After expanding their product line and changing production and distribution strategies, Vornado then passed on to the US supermarket Two Guys. Two years after the death of Ralph K. Odor, Michael Coup took over the rights in 1989. He revived the past Vornado brand by working closely with one of Vornado’s longest-standing designers: Richard Ten Eyck. Since 2006, the Vornado Air LLC is led by a private equity association with headquarters based in Kansas, USA. Today, Vornado has subsidiaries in 12 countries all over the world, including Australia, Japan, Canada, New Zealand and Germany. Industrial designer Richard Ten Eyck came up with the shape of the VFAN in 1945. His model was heavily influenced by the popular aerodynamic style. The housing was made of metal and the blades were made of bakelite, one of the first artificial plastics. The advanced design improved the aerodynamic properties while decreasing operational noise at the same time. The powerful Vornado fans with their stylish looks perfectly reflect the nuclear age that would follow where designers of all kinds of appliances were inspired by atomic research and aircraft. Centre: vornado.com showing the backside of the new VFAN model. The greenish pastel colour has already been used for the original from 1945. In the centre you can see the elongated air passage. The patented Vornado technology is found in a variety of desk and floor fans as well as other items used for air circulation, including air purifiers with HEPA filters or fan heaters amongst others.